Living People on U.S. Postage Stamps… They’re Brits! It's Magic! Today, November 19th, the U.S. Postal Service issues stamps showing identifiable living people. Will they be prominent U.S. politicians? Inventors? Philanthropists? Sports heroes? No, they’re characters from the “Harry Potter” movies. At first glance, this appears to reflect a recent and very major change in policy. Until now, you had to be dead to be on a stamp. Even the images on the 1960’s and 1970’s “Spacewalk” and “Moon Landing” stamps showed “idealized” astronauts - rather than specific pictures of living people. The Harry Potter stamps seem to be the first living people under the new policy. However, the Postal Service contacted us to point out the 2007 “Star Wars” stamps also showed actors. They make the point that while both sets show real, identifiable people, they’re portraying characters rather than themselves. So technically, we’re still waiting for a living person to be honored on a stamp. The stamps will be good for first-class mail and come in booklets of 20 that sell for $9.20 each. The Postal Service is hoping they’ll be popular. The specialty magazine Linn’s Stamp News reports 100 million stamps – in five million booklets – have been printed. While they won’t be available at every post office, they can be ordered from the Postal Service’s website, usps.com. I also remember stamps honoring non-Americans, such as Winston Churchill and Dag Hammerskjold. Not to mention Sun Yat-sen, Raoul Wallenberg, Raphael, Paderewski, Louis XVI, Frida Kahlo, Jesus, Garibaldi, Gandhi, St. Francis, Copernicus, Simon Bolivar, the Beatles, Dante, Mother Theresa, etc. I would suggest the Voldemort stamps for replies to legal demand letters, correspondence to ex-spouses and IRS, etc. Great story. To clarify, these are not the first U.S. postage stamps to feature living actors portraying movie characters. In 2007, the Postal Service issued stamps commemorating the movie, "Star Wars," and the stamp designs included images of living actors in character. 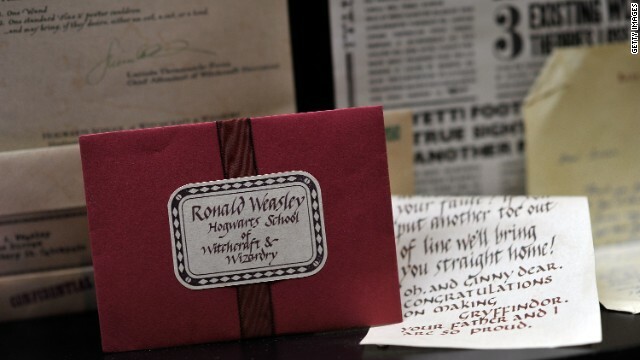 The Harry Potter collectible stamps show the actors in the roles they played in the Harry Potter films. Traditionally, USPS stamp subjects were limited to "American" themes. However, that has not always been strictly adhered to, the Edith Piaf stamps being a recent example. I think the Stamp Advisory Committee is more upset that they were not included in the vetting of these stamps.